The Pit River consists of a series of dams and reservoirs that stretch for some 30 miles from Lake Britton to Shasta Lake. If there’s one river around here that intimidates people, it’s the Pit. One reason for this could be the common descriptions of the river: “The Pit River is a nasty, gnarly thing… like walking on greased bowling balls all day,” or “It’s not a question of when you fall in on the Pit, it’s how many times!” There is some truth to these statements. The Pit tumbles down a steep, rugged canyon marked by a seemingly endless array of slick boulders. The hiking can be arduous, and the wading can be tricky. For those adventurous anglers willing to work a little, the rewards of fishing the Pit River are well worth it. The tough reputation of the river keeps many anglers away, making the Pit a great place to get away from it all. Each and every pocket of water on the river holds fish, and amazingly large fish at that. These wild, football-shaped Rainbows are the definition of strong-willed and hard-fighting. 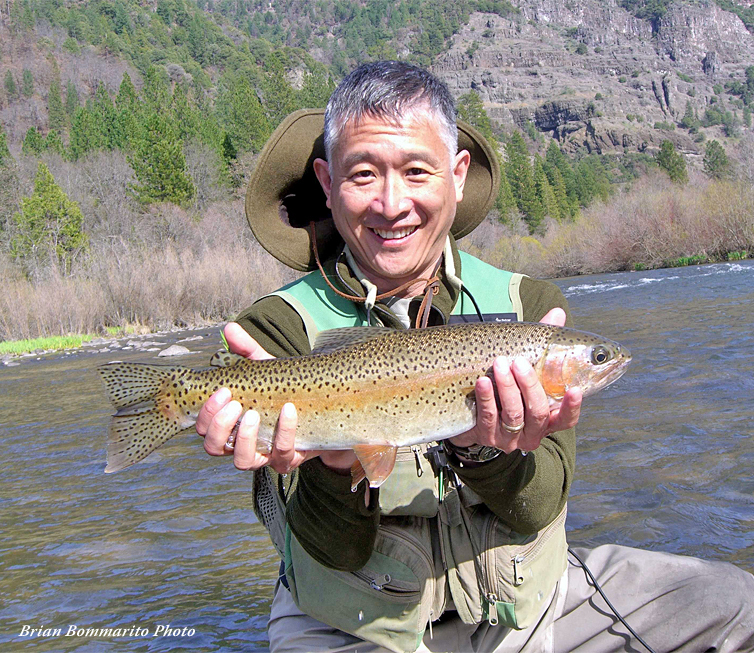 Many anglers, after finally summoning up the courage to test the Pit’s tumultuous waters, have remarked that it is arguably “the finest wild trout river in California.” Indeed, the strength and power of these scrappy rainbows will astonish any angler who challenge and conquer the Pit River. Included in your guided angling package on the Pit River is 8-10 hours of guided fishing with lunch provided. Regulations were changed a few years ago to allow year-round fishing on the Pit River. While runoff and weather conditions can impact the river's fishability at times, the Pit River can provide some great walk and wade, classic pocket water fly fishing options through much of the year. Late winter and early Spring fishing on the Pit River, if water conditions and weather cooperate, is terrific. There are hatches of March Brown mayflies and smaller caddisflies that can begin as early as February and run throughout March and April, topped out by Pale Morning Duns that start in mid-April. And the massive stoneflies even begin to hatch as the weather warms in April. 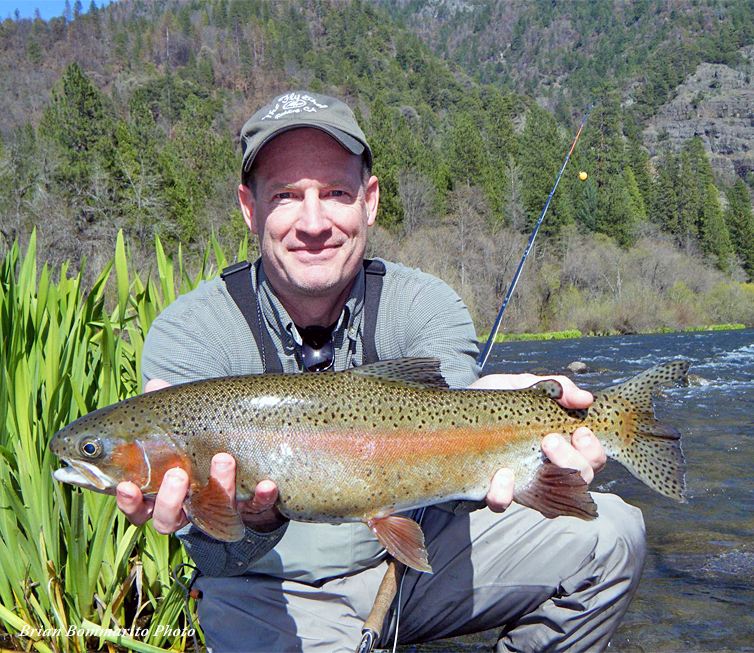 The fishing during these early months is largely dependent upon weather conditions and runoff. 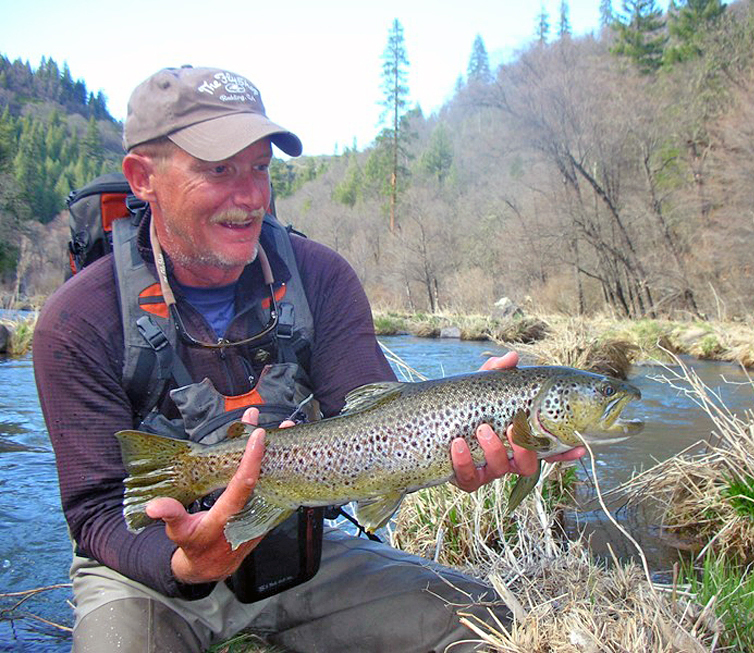 Fortunately, the river's flows are almost entirely controlled by releases from its many dams and powerhouses, so even on wet years it generally remains fishable through much of the spring season and the Pit has become our favorite early season fishery. Stormy weather can bring on some memorable Baetis mayfly hatches, while the warm, sunny days that mark the start of spring in the North State are quite possibly the best conditions for the fishing that time of year. The warm weather gets the bugs moving, and the more bugs are active the more responsive the trout are likely to be. We've discovered that some of the best dry fly fishing of the entire year comes on sunny days in March and April on the Pit. 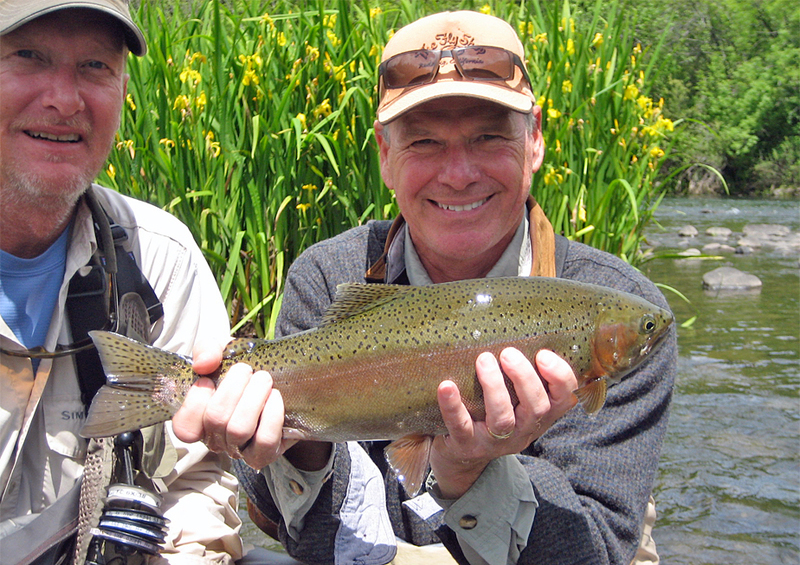 May and June have long been considered some of the "prime time" months on the river. As the weather warms in late spring and early summer many different types of insects begin to hatch on the Pit, creating consistent opportunities throughout each day to catch fish on both nymphs and dry flies. The most important hatches on the Pit this time of year are the stoneflies. The massive salmonflies are the first of the stoneflies to appear, hatching sporadically throughout the month of May and sometimes into early June. They are followed by numerous Golden Stoneflies and Little Yellow Stoneflies, all of which can get the Pit River's wild rainbow trout rising on the surface. And even when the fish aren't focused on the flying adult insects, the pocket-water nymphing with big stonefly nymphs can be as good as it gets. The "dog days" of summer are the best time of year to wet-wade the Pit River, and highsticking the pocket water and oxygenated pools of the river will produce nice trout throughout the morning and middle of the day, with hatches of Golden Stoneflies and caddis bringing about sporadic dry fly opportunities in the hour or so just before dark. Fall brings on some of the Pit River's bigger bugs, including its famous Isonychia mayflies and a few giant October Caddis, as well as the best weather of the season. Both of these large insects emerge by crawling out onto streamside boulders and vegetation, so although dry fly opportunities are rare, the powerful rainbows of the trout often gorge themselves on the nymphs that are easily dislodged in the tumultuous pocket water of the steep canyon. On overcast days, there can be some phenomenal blue-winged olive hatches. These tiny mayflies respond to changes in barometric pressure, and hatch whenever a storm front moves through the area, stimulating some great midday dry fly action on all of our regional streams, including the Pit, throughout both the fall and winter seasons. The Winter Months on the Pit River provide some great late-season opportunities for die-hard trout anglers. The mornings and evenings are often cold in the narrow river canyon, but midday sunshine can warm the river up and provide some good action on nymphs and streamers for some of the river's bigger fish holding in the deeper pools. And anglers fishing the Pit in the winter months should always be prepared with a few blue-winged olive dry flies, as overcast afternoons can have some memorable Baetis mayfly hatches. Most of the access points on the Pit are about an hours drive from our front door. The Pit River is a pocket-water fisherman's dream-stream, flowing through a scenic canyon that is littered with boulders of all shape and size. These boulders, and the oxygen-rich waters flowing around them, provide the perfect sanctuary for dozens of species of aquatic insects. This massive food source enables the Pit's foot-ball shaped wild rainbows to grow big, fast, and powerful. Our guide staff primarily nymph fishes this stream, although there are occasional hatches of stoneflies, caddis, and mayflies that will bring some fish to the surface, searching for an easy meal. Our guides have put in a lot of time exploring the many rugged miles of the Pit River, and know some fantastic places to wet a line (and tie into leaping rainbows cast after cast). When our guide staff isn't working hard on the Lower Sacramento River, this is where they spend their fishing time, and some of our guides specialize in fishing this wonderful river. They know the river well, and have figured out the secrets to success for all the different seasons. Despite the miles of accessible water on the Pit, utilizing one of our river guides can dramatically increase the learning curve, saving hours of guesswork and frustrating lost time. Our guides are all excellent instructors, so your day on the river will be a great learning experience, not only about the river itself, but also the various techniques that can be successful there. 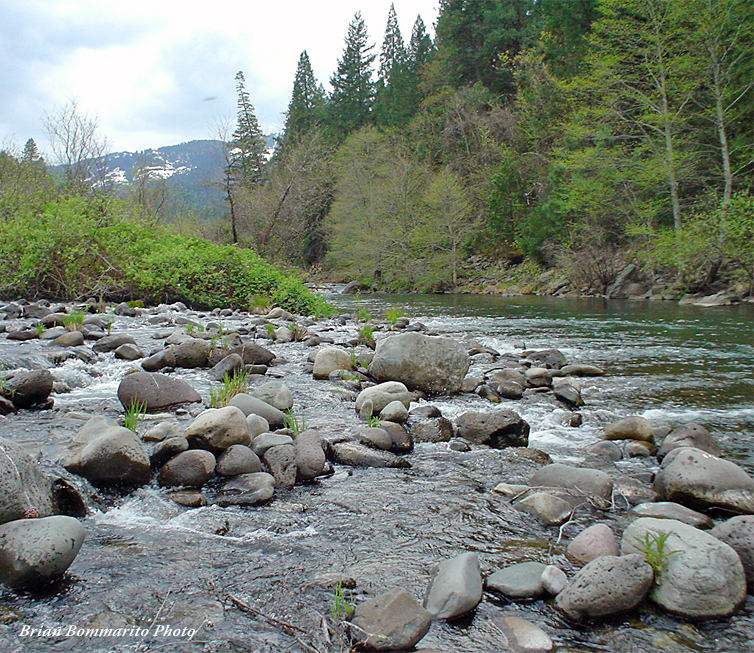 The Pit River is only an hour's drive from Redding, and some sections are not far from of the town of Burney. While most of our Pit River anglers choose to stay in Redding, some also opt for lodging in the Burney area, staying at one of Burney's cozy motels or nearby campgrounds. 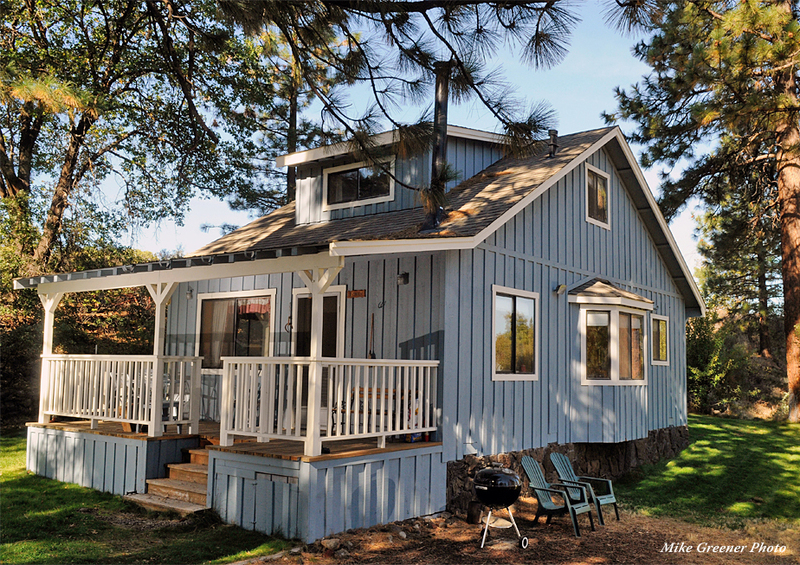 • This secluded, intimate hideaway is sure to please everyone in the family, from hard-core anglers to those just dreaming about a quiet, relaxing getaway. • Tucked away in a hidden corner of north eastern California is Clearwater Lodge. Nestled in a canyon along the Pit River, this 1920's era classic western fly fishing lodge is in the heart of the west coast's best fly fishing. 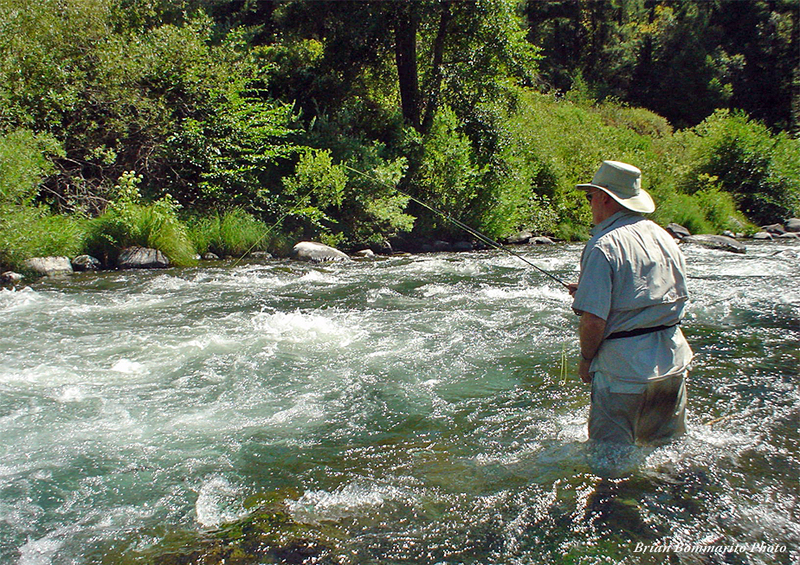 • Easy to find in downtown Burney right on Hwy 299E, a long-time favorite for Fall River and Hat Creek anglers. • Easy to find in downtown Burney right on Hwy 299E. • Reservations not required, Deep Creek Campground can be accessed from the community of Big Bend; 4 wheel drive is not required, but may be a good idea. • Shaded campsites, outhouse facilities, fishing access on Pit River. • Great campsites, outhouse facilities, cabin rentals, hiking trails to majestic Burney Falls, fishing access on Burney Creek. • Located on upper Hat Creek, this campground and RV park is approximately 30 minutes from Fall River, but does have some nice sites and access to upper Hat Creek. 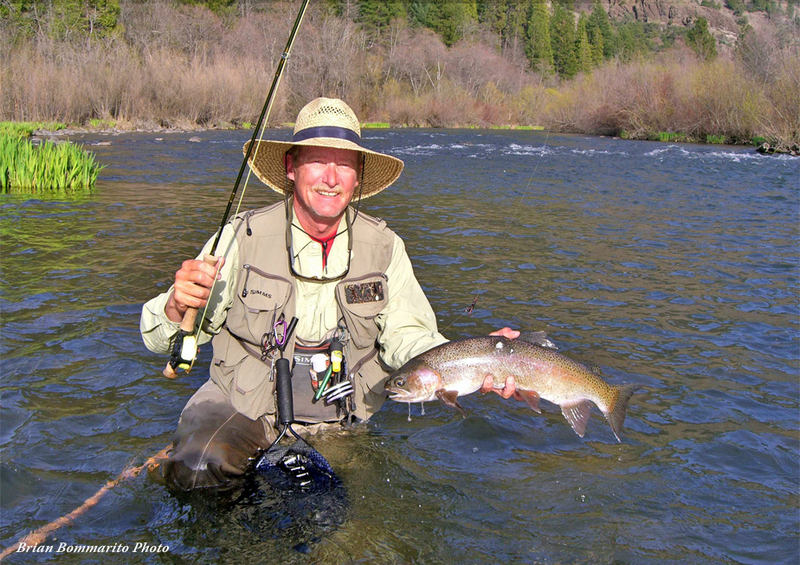 Most Pit River walk-and-wade trips will start by meeting your guide either at The Fly Shop, at the Big Bend Store (also called the “Pit Stop”) on Big Bend Rd, or in the town of Burney. Take I-5 North approximately 4.9 miles. Take Exit # 680 (Highway 299 East) toward Burney. Follow Highway 299 East for approximately 1 hour and you’ll arrive to in the quaint community of Burney.